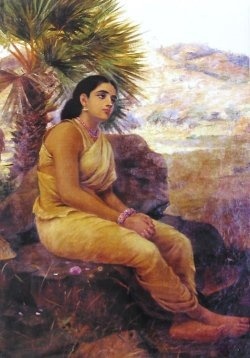 Sita, abandoned by her husband Ram, found love and support from Valmiki and his disciples in the Ashram. Especially the female ascetics took special care of her, as she was pregnant. After a few months, Sita gave birth to twin boys. Valmiki blessed them, naming them Lava and Kusha. Lava, the youngest, was like his mother Sita in features, complexion and mannerisms, fair and gentle. Kusha had his father’s features, complexion and mannerisms, dark and kind. Lava and Kusha enjoyed singing the Ramayana, but without knowing that they were singing about their own parents’ story, as Valmiki had promised Sita that he would not reveal her identity to anyone, which included Lava and Kusha. Valmiki also taught them special astras (energetic weapons), to be used only in unavoidable situations. The twins were great in their studies as well as in combat training. Meantime in Ayodhya, the wives of Rama’s three brothers (Mandavi, Urmila and Shrutakirti) also gave birth to two children each. Lakshmana and Urmila had Angada and Chandraketu. Bharata and Mandavi had Thaksh and Pushkal. Shatrugna and Shrutakirti had Subahu and Shatrughati. As much as these events were to be celebrated, somehow things were not the same in Ayodhya ever since Sita was sent away. Rama couldn’t be himself without his beloved wife Sita. Rama’s state affected all in Ayodhya Kingdom. Rama didn’t have the heart to see the people and help their lives as a king. Ayodhya started to dim in its glory. The royal mothers were very worried. Vasishtha, Rama’s Guru wasn’t pleased with what was happening either. He needed to do something to restore the glory and happiness back to Rama-Rajyam (Rama’s Kingdom), Ayodhya. At Valmiki’s Ashram, Lava and Kusha were preparing for their journey to Ayodhya. They were going to fulfill their Guru Valmiki’s command to recite the Ramayana there. They went to their mother to get her blessings. Sita blessed them and told them to meet Rama, the hero of the Ramayana, and to get his blessings before coming back to the Ashram. The twins were very excited to have a chance to meet Rama and Sita in Ayodhya. They started their journey towards Ayodhya by singing the story of Rama along their way in all the villages and cities. They were instructed by Valmiki to introduce themselves as his disciples, which they did proudly. People in thousands gathered to see the twins recite the Ramayana. The news about two young children reciting Rama’s story reached the palace grounds. The queen mother, Kaushalya requested her guards to invite these children to perform in front of her and the rest of the royalty. 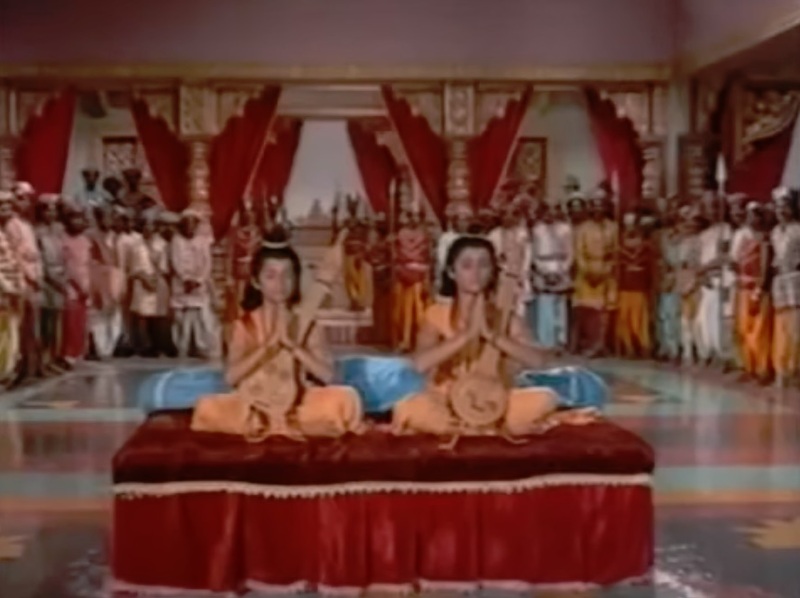 The twins were very happy that they had a greater chance of meeting Rama and Sita at the palace. When the children arrived at the assembly, their looks and divine presence mesmerized everyone. When they started singing, the audience was in awe about their talent and their devotion to the King Rama. Rama himself heard them singing and rushed there to hear them. The minute he saw them, he felt something in his heart. After the twins finished reciting the Ramayana, he inquired about the composer of this beautiful poem, and asked the children who they were. They answered that they were disciples of Maharishi Valmiki, who composed the poem and taught it to them. Rama felt some sort of happiness after a very long time. He wanted to reward them with jewels and pearls. They refused to accept any gifts and only wanted to see the queen, Sita, as they were so eager to meet her. Without a word, Rama turned and went into his chamber, his head bent down in sorrow. The twins worried that they said something to hurt Rama. They asked Kaushalya, “Did we say something wrong, to hurt our hero, King Rama?” With a heavy heart and eyes full of tears, the queen mother broke the news that Sita been sent away. The children were very disappointed to hear about Rama renouncing his wife in order to fulfill his duty as a king to his constituents. They were too small to understand the sacrifice that Rama had made. They were angry, to a level of hating Rama, for him making such harsh decision. They went back to the Ashram convinced not to sing Rama’s story anymore, as they felt betrayed by Rama due to his actions towards Sita. Sita was waiting at the Ashram, eager to ask the twins about Rama. But she saw their disappointment and anger in their faces. She asked them about Rama’s well-being. The twins answered with disgust that he was doing fine. Then she asked why they were annoyed and angry. Thus Sita came to know about what had happened at the palace. She advised her children not to be angry, explaining that Rama has to follow his dharma as a king, fulfilling the laws of the land. The children were not ready to accept her argument, also saying they were worried about what would have happened to Sita in the forest. They also told her their decision not to sing Ramayana any more. 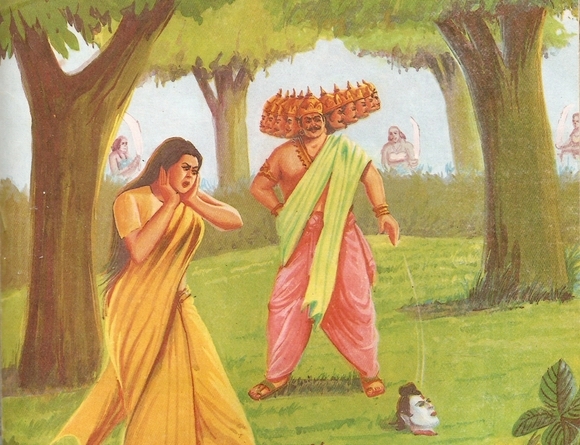 Sita was devastated to hear the children feeling such hatred towards Rama, as she was expecting the exact opposite from them after they met him. Whatever Sita said didn’t appease the children. Finally, Sita said that she would not speak to them ever again if they don’t sing the praise of Rama. Without any other way, half-heartedly, the children agreed to continue to sing the Ramayana, for the sake of their mother’s happiness. In Ayodhya, poverty and depression was on the increase. Drought was taking hold. Food shortage was becoming a big issue and, the never-before heard word in Rama-Rajyam, crime was staring to take root. Maharishi Vasishtha, Guru of Rama, had to do something to get Ayodhya out of the desperate situation it was in. After a lot of thought, consulting with the queen mother and Rama’s brothers, he decided to ask Rama to perform a ceremony named “Ashvamedha,” for the benefit of the kingdom. In an Ashvamedha yaj~na, a horse with the king’s flag was sent on a tour through all the lands, to return to the yaj~na if no one opposed it or imprisoned it. If it was imprisoned, the king will have to free it by peace or force. Hearing this from his Guru, Rama was puzzled because a king without a queen cannot perform this yaj~na. The only way to perform this mighty yaj~na would be for Rama to remarry. When this was suggested, Rama became unusually angry and outright rejected the plan. He told everyone that he is a follower of the ‘eka-patni-vrata’ (vow of loyalty to one wife), that his love for Sita was only for her and cannot be shared with anyone else. 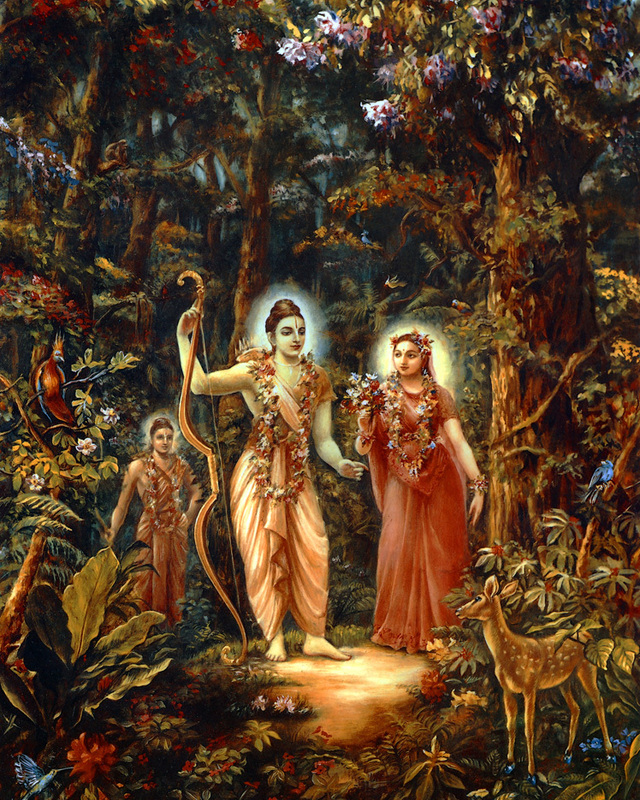 Rama was a living example of righteousness. He said he couldn’t even dream of being with another woman. 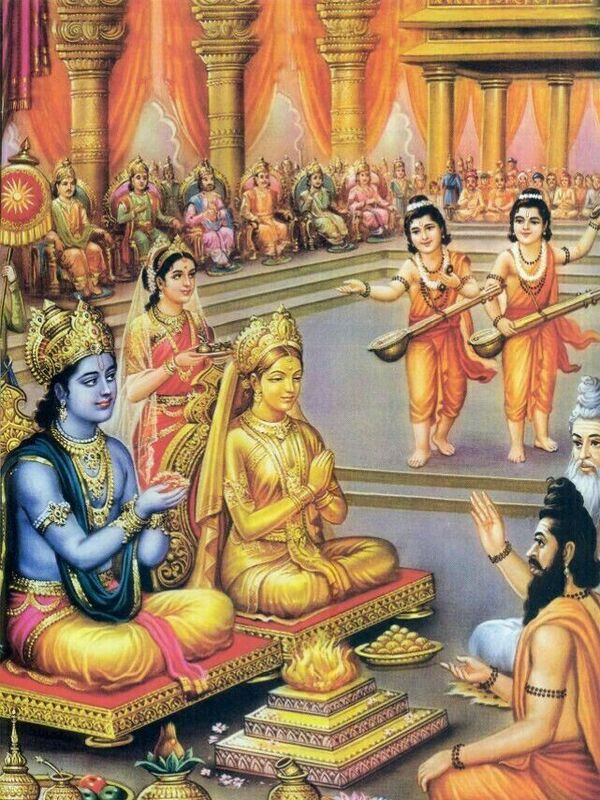 Vasishtha suggested they make a golden statue of Sita, to have next to Rama while conducting the yaj~na. Rama agreed, only to fulfill his duty as a king. The citizens of Ayodhya brought all the gold they had, to be used for the statue of Sita, saying that the state of the land was their fault to begin with. This was the first time they were able to see Rama after Sita was sent away. They were so happy to see their king. The statue was made and the yaj~na begun. Rama’s brother Shatrugna led Ayodhya’s army, following behind the horse, chosen especially for the tour of the land, carrying Ayodhya’s flag. The news of Rama’s Ashvamedha Yaj~na reached Valmiki’s Ashram. Sita was devastated to hear the news, as she knew a king had to have his wife in order to perform such a ritual. She fainted, as she couldn’t bear the thoughts of Rama with another queen. Rishi Valmiki knew what was happening with Sita and went to her rescue. While she was unconscious, he was able to transmit his meditative energy, to lift Sita out of her physical body on a trip to Rama’s chamber in Ayodhya. Sita saw the devasted Rama treating her golden statue as her, pouring his heart out to the statue. This made Sita even sadder, but at the same time relieved that her husband’s love for her had not diminished. Seeing her husband’s devotion towards her, even after he had renounced her, brought peace to Sita. She travelled back to the Ashram, reentered her physical body and thanked Valmiki for the revelation. She was filled with remorse and shame that she doubted her beloved husband, so she wanted to do reparation for her action. As suggested by Rishi Valmiki, Sita decided to do a puja for Mata Lalita Devi, to be done uninterrupted for ten days. For the puja she needed one thousand lotus flowers. Lava and Kusha promised to bring them to her. Guru Valmiki had an important event to attend and left the ashram for a few days. Sita started her puja and immersed herself in the worship of Mata Lalita Devi. This entry was posted in Mystical Living on April 21, 2019 by Swami Nirmalananda. Chakras are not important. It’s the nadis that count, especially the central energy channel (nadi), through your spine. All the other 71,999,999 nadis radiate off from it. Secondary nadis crisscross the central sushumna nadi from side-to-side several times, creating energy whirlpools that are your primary chakras. If the energy flowing through your nadis is low or imbalanced, the whirlpools won’t whirl. Chakra means “whirling disc,” so the whirl is essential to the meaning of the word as well as to the inner function each performs. Also depicted as a series of lotuses, your chakras depend on your nadis in order to function. Svaroopa® yoga works on your nadis, thus balancing all your chakras. Every Svaroopa® yoga class is a full nadi opening and chakra-balancing session. The map of inner development shown in the chakra drawings clearly displays the inner process of spiritual development. First you uplift your focus from your lower three chakras, into and through your upper three and beyond. Beyond the six chakras, your sahasrar (crown) blossoms you into what you have always been, though you didn’t know. You don’t lose your lower 3 chakras when your crown blossoms. Once your chakras are opened, it’s like you’re able to use both hands to play all the keys on the piano. Your heart is open while you are paying your bills, which is a first chakra issue (survival & security). You see and understand your own inner dimensions while you are arguing with a teenager, a second chakra issue (esteem & affection) mixed with a third chakra (power & control). Even if you’re not yet enlightened, you run on the energies of your chakras. When the energy flowing through your nadis opens and balances your chakras, every interaction is inspired. Every thought is scintillating with Consciousness. Every choice is made for the betterment of others. The vinyasa (sequencing) of Svaroopa® yoga uses the poses to create an inner opening from tail-to-top. This invites your next step: the unlocking of the energy at the tip of your tailbone for the inner arising of Consciousness-Itself (Kundalini). For this you need shaktipat, the awakening of Kundalini. Signs that Kundalini is awakened include heat climbing your spine, inner sensations or even spontaneous physical movements. 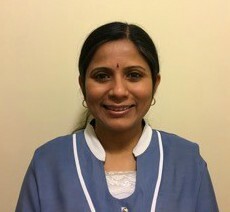 Svaroopa® yoga comes from Swami Nirmalananda’s experience of these physical movements, clearing away imbalances and blockages from her nadis. This is where all yoga poses and breathing practices originated from. Once you’ve received Shaktipat, you may experience certain chakras being opened in meditation, perhaps seeing a lotus, the God or Goddess residing in it, or the colors within it. You may feel subtle sensations of the inner unraveling, even tickles or thrills of bliss. You get what you need and what you are ready for. When you cooperate with this process, it goes easier and faster. This is one of the things that makes Svaroopa® yoga unique. Each pose targets specific areas of your spine, to reliably unravel the blockages in the same way that Kundalini does. This inner opening also opens up profound mystical experiences for you. Other styles of yoga teach practices to invoke Kundalini, while scholars study about Her in the Sanskrit texts. Yet, without Kundalini being awakened, it’s like they’re studying swimming without getting wet. Theory doesn’t take you to experience. 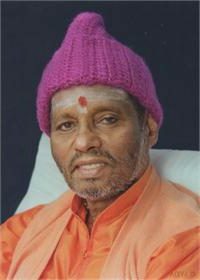 The most important feature of Svaroopa® yoga is that our teacher, Swami Nirmalananda, is a Shaktipat Guru. She knows Kundalini. 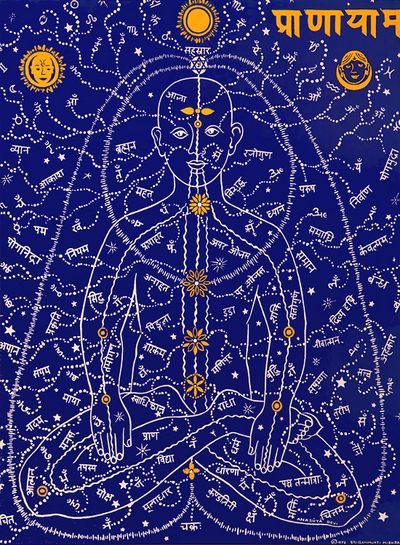 Thousands of Svaroopis have gotten Kundalini awakening. While you get amazing physical benefits from our core opening practice, this inner awakening is the most valuable result. It opens up the mystical dimension of your own Self. This entry was posted in Mystical Living on April 14, 2019 by Swami Nirmalananda. Yoga’s map of chakras is very well known, a beautiful description of the multidimensional reality within your own body. Yogis perceived and mapped these energies thousands of years ago. You may have seen modern drawings of different colored lotuses along a spine, depicting the human energetics system. Your spine is the main energy channel (nadi) of the 72,000,000 nadis that make up your body. Three nadis are primary: the central channel through your spine plus one on each side. Your left and right nadis crisscross several times, creating energy whirlpools that are your primary chakras. Located along your spine, they are in the center of your torso, both front-to-back and side-to-side. Each is an energy vortex that can blossom like a lotus, though currently partially closed and probably imbalanced. So many books and internet sites offer information though few report yoga’s teachings accurately. Swami Nirmalananda says, “Artistic misrepresentations don’t help you explore the mystical dimensions within; like a GPS gone awry, they lead you in the wrong direction.” So, what do you need to know? Every chakra has multiple colors in it, not the single color usually depicted. The different colors in the lotus center, on the petals, and in the Sanskrit letters on each petal have deep significance, along with other intricacies to be blissfully explored within. You have no blue or green chakras. It is not a rainbow in there! As you explore, you will find a lot of red in various centers, which is the color of energy, blood and embodiment. Chakras are grouped along your spine, not evenly spaced. Check the accuracy of a drawing by seeing if the lower three chakras are all below your waist. Many modern writers and artists don’t accurately separate your first 2 chakras, at the bottom and top of your tailbone, only 1½ – 2” apart. You have only 6 main chakras, not 7. The energy center at the top of your head is not a chakra, because it is not a whirlpool where nadis cross. And it’s already open. This is the good news. The value of this map of Consciousness is that it clearly displays the inner process of spiritual development, uplifting your focus from your lower three chakras, through your upper three and beyond. Chakras 1, 2 & 3 are about external circumstances and your power of choice; 4, 5 & 6 are about progressive openings into transcendental consciousness. Beyond chakras, your sahasrar blossoms you into what you have always been, though you didn’t know. This entry was posted in Mystical Living on April 7, 2019 by Swami Nirmalananda. Rama felt as if his heart was pierced by an arrow. He thought, “All this time, I have been living by the law of righteousness but I have not realized about what my citizens thought about my actions. I need to understand my citizens’ feelings in order to be able to rule the country well, with laws that fit everyone!” His heart was filled with sorrow as he returned to the palace, thinking he failed on his duties. Being a democratic ruler, he decided to banish his pregnant wife Sita from Ayodhya, though it was with unbearable pain. He asked Lakshmana to take Sita to the forest, there to inform her of his decision. No matter how much Lakshmana tried to present a case against Rama’s decision, it didn’t work. Lakshmana found that he was hurting his brother more, for he was already in unbearable sorrow with what he had ordered. Taking his brother’s orders, Lakshmana left to fulfill this duty. With a very heavy heart he took Sita to a nearby forest and told her that Rama had ordered him to leave her in the forest, giving all the details. At his first explanation, Sita cried out, “How can Rama do this to his pregnant wife, who proved her chastity in Lankapuri!” Then, coming to terms with what was happening, she decided to abide by her husband’s wishes and said farewell to her beloved brother-in-law. 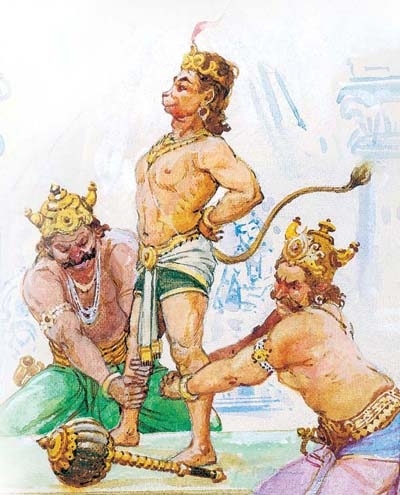 Unable to bear what he was doing, Lakshmana sought Hanuman and let him know what had transpired. Without a word, Hanuman just leapt up to fly in the direction where Lakshmana had abandoned Sita. Nothing was the same after this: the Ayodhya kingdom was in darkness, as was Rama, who preferred to be alone with his thoughts of his beloved Sita. In the meantime, after a long search Hanuman found Sita, but he kept himself hidden since he had not gotten any orders from Rama to help her. But he promised himself that he will not let any harm come to Sita. Sita roamed in the woods for hours and days, sobbing in grief. Hanuman silently followed her around with no direct way to help her, leaving fruits on her way for Sita to eat. In her state of mind, she only nibbled on them and continued to wander aimlessly through the woods. Sita was very tired and sat down to rest a bit. Some young sages-in-training walked by her and stopped in surprise when they saw her. They wanted to know who she was. Not wanting to reveal who she really was, Sita said that she is a pregnant woman seeking shelter. They started hurrying back from the way they had come, saying they were going to bring help. Taken by her divine beauty and her sorrowful state, the young sages went back to the ashram and told their Guru Valmiki about what they saw. There once lived a hunter named Ratnakara, a thief and ruthless man. He killed harmless birds and gentle animals for food, robbing anyone and everyone who passed through the forest in which he lived. One day he came across the Saptarishis, the seven great sages of all times. He decided to rob them as well. He stopped them, threatening them with his weapons, demanding all the wealth they possessed. The sages explained that they had surrendered themselves to God and didn’t own any wealth. They then asked him why he was stealing? Ratnakara explained that he had to support his family, so he chose robbery as the means. The sages asked him whether his family would partake of the sin that came from what he does for his livelihood. Ratnakara answered without a doubt, “Yes!” But the sages asked him to go get the answer from his family, promising to wait for his answers. The hunter went straight to his wife and asked whether she is willing to share his sins. Even though she was benefiting from his sinful life, she refused to share the sins. Hoping that at least his children would partake of the sins with him, he was heartbroken by hearing the same answer from his children. In disbelief at what he had heard, he returned back to the sages with a heavy heart. Ratnakara threw himself at their feet, asking to redeem his soul. The sages blessed him and gave him a mantra. He couldn’t remember and say the holy name of “Rama,” so they gave him the mantra “ma-ra,” meaning “kill,” but which is an inverted version of “Rama.” He was asked to repeat the mantra without interruption until they returned. Ratnakara sat in a meditative pose, reciting the mantra for years. An anthill formed around him, ultimately covering him fully. After many years, the seven rishis returned and brought him out of his great tapas (austerities). He came out a person different in every aspect. The rishis blessed him as one of the great rishis, naming him “Valmiki” since he came out of “valmik” (anthill). With the rishis’ blessings and with his spiritual energy and knowingness, he earned the respect of everyone from everywhere. Once he was visited by Maharishi Narada. Valmiki welcomed Narada with great respect. Narada blessed Valmiki and they started conversing about great beings living by righteousness. Valmiki asked Narada to name the most perfect being, who is living a dharmic life. 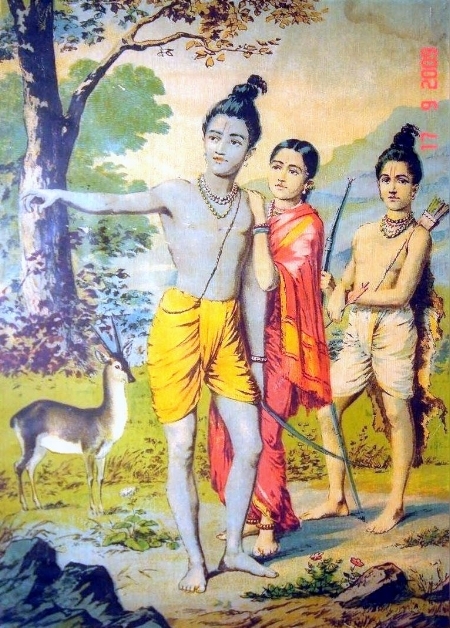 Narada immediately named Rama, the King of Ayodhya. 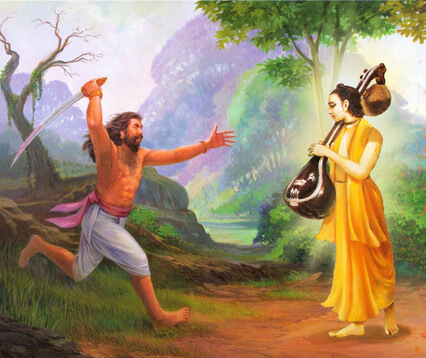 Narada started telling the wonderful story of Rama, which fascinated Valmiki. 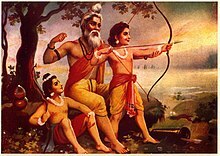 Valmiki was very grateful to hear the story of Rama, and continued to repeat it in his mind all the time as though he were hearing it afresh. One day Valmiki was on his way to have a bath in the Tamasa River, attended by one of his disciples. He saw two birds on a branch of a tree, courting and cooing together. Mesmerized by the birds’ love for each other, Valmiki stood there watching them. As he was admiring them, a hunter killed one of the birds; the other one was devastated and in deep sorrow. 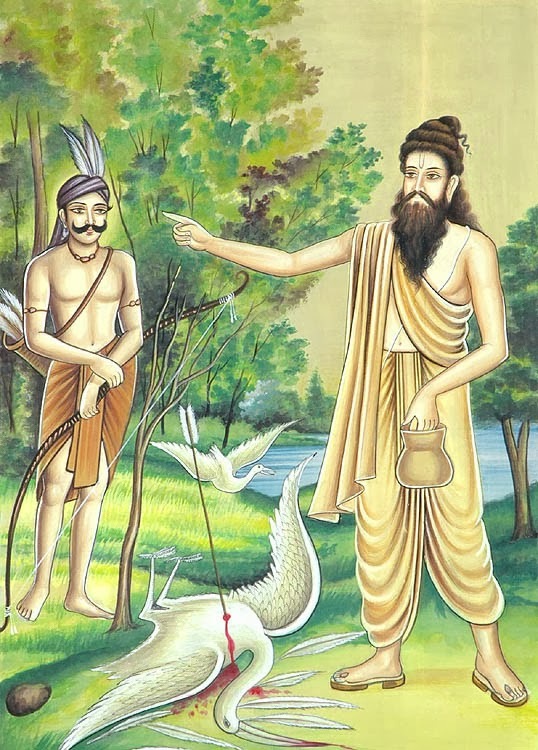 In his grief, Valmiki cursed the hunter for being so cruel. The Sanskrit words he uttered spontaneously, because of his grief (shoka), came out in verse form, with melody and rhythm. This was the first “shloka” (Sanskrit stanza) ever. At that very moment, Lord Brahma, the lord of creation, appeared in front of him and requested Valmiki to write the story of Rama as narrated by Narada. Brahma blessed him to write what he knew and that the unknown would be given to him. With that blessing, Valmiki sat in a meditative pose and the story started unfolding in front of him as though he was witnessing the whole thing all over again. Valmiki started writing the first epic of all times, “Ramayana” in stanza form. After finishing writing the Ramayana, he started reading it to the public at large. The crowd was spellbound by the story. A little while later, the young sages returned with their Guru, Rishi Valmiki. As soon as the Rishi saw Sita, through his spiritual insight, he knew who she was. He introduced himself as Valmiki and invited Sita to his hermitage, greeting her with utmost respect, offered her help, assured her of his guidance and protection. Not revealing Sita’s true identity to anyone, Valmiki asked everyone at the ashram to treat her with all the love they had. Sita, abandoned by her husband, found love and support from Valmiki and his disciples. Especially the female ascetics took special care of her, as she was pregnant. This entry was posted in Mystical Living on March 24, 2019 by Swami Nirmalananda. You are so much greater than you could ever imagine! Yoga’s sages say your inherent essence is the whole of Divine Consciousness. How great is that? Yet your Divine Essence is hidden within and must be unveiled. The human condition is that you don’t know your own Self. The ultimate task of every human life is to discover who you really are. Yoga’s stated goal and purpose is to unveil your spiritual greatness to you. The sages gave us the asanas (yoga poses) as a way to start that process. While recent research studies prove yoga’s value, those studies are not proving that yoga is better than exercise. Sometimes exercise beats out yoga in the studies, though sometimes yoga beats out exercise. Sometimes they come out the same. Research proves that exercise gives you 90% of yoga’s benefits because they are studying exercise-oriented yoga styles. But what if your yoga is a spiritual practice? Researchers haven’t studied Svaroopa® yoga, so they haven’t compared spinal decompression to exercise. They haven’t compared the bliss of the Self to the bliss of jogging. Even if they do begin these comparisons, they’ll probably continue to measure physical and psychological benefits, not spiritual progress. Yoga’s stated goal and purpose is to unveil your spiritual greatness to you. The true value of SvaroopaⓇ yoga’s poses is found in the inner opening to your own Divine Essence. Fortunately, the same poses free you from pain, open up your breath and heart and give you a new lease on life. But their true value is their spiritual power. While you can use the blissful baby steps of Svaroopa® yoga poses as an entry point to meditation as well as work on your mind and heart with yoga’s many powerful techniques, there’s more available. Svaroopa® yoga is all about your spine because of the meditation energy that arises through your spine. It is because this uplifting energy flows upward that you have to sit up. Get your spine vertical. Your own inner power of revelation, the energy of your own enlightenment is arising within you. Called Kundalini in Sanskrit, it has been sparked awake by the Grace that underlies and infuses your practices. 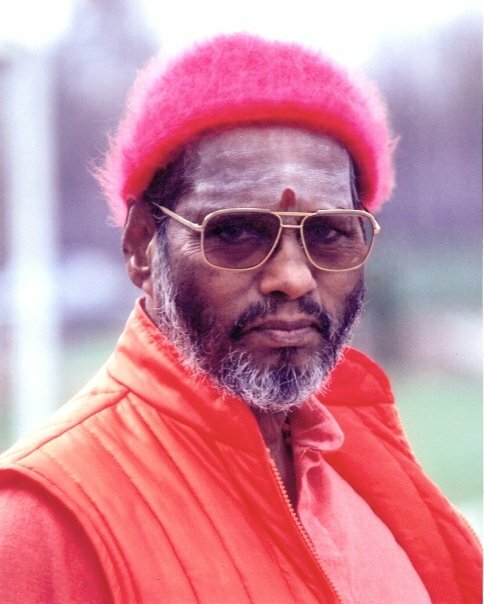 This is the gift that Swami Nirmalananda brought from India and passes along to us. If your goal is a spiritual goal, if what you want is liberation, this energy of upliftment will carry you all the way. Along the way, this Divine inner arising expands what you get from yoga exponentially. Amazingly, meditation will fix your body, open your heart and transform your mind, while it gives you your own Divinity. You can have it all! The goal is greater than merely the physical and psychological benefits yoga poses offer. The goal is your own Greatness. And with the Grace of your SvaroopaⓇ practices, your goal is guaranteed. Dive inside and discover your Self. This entry was posted in Mystical Living on March 17, 2019 by Swami Nirmalananda. Musicians, artists and writers base their livelihood, even their life, in their creativity. Yet everyone is creative, even if you don’t think of yourself that way. For example, coming up with a solution to a problem is creative: that moment where you think, “Oh! I know what to do about that.” That aha moment is an inner arising; it bubbles up just as joy and happiness do. You have an amazing potential hidden inside you. So how do you tap into that potential and become more creative? You currently use your creativity in a limited way: to plant a garden, to decorate your home or your body, or even to bring a new life into the world. Creativity is blissful! 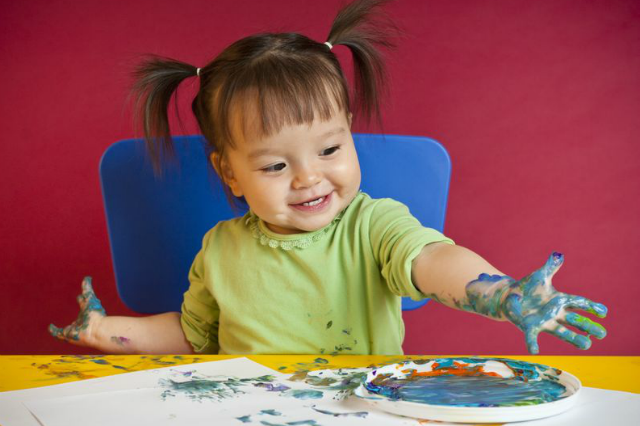 This is why there are so many arts and crafts stores with so many options for you to explore and enjoy. Rukmini remembers how much her children loved to be creative: “They’d come home from pre-school with more drawings and paintings and macaroni art than could ever fit on the refrigerator, excited and happy to share each one with me.” Do you remember the joy and pride of showing your mom, ”Look what I made!” Being creative feels wonderful, because in your own small way you’re being Brahma. You’re experiencing the flow of Consciousness, being Shiva and manifesting something from your own being. Your Svaroopa® yoga and meditation practices progressively dissolve your creative blocks. Energetic blockages in your spine keep you from your own creativity and worse, keep you from experiencing the source of your creativity — your own Self. Especially once Kundalini is awakened, your yogic openings clear the way for your creative capacity to blossom forth from within, along with the radiance and bliss of your own being. Meditation is particularly effective because it is the direct route to your own source, plus it clears and reconditions your mind, so the light of creative consciousness can shine into your life and into the world. Don’t allow yourself to get sidetracked along the way. It’s easy to lose track of your goal to know your own Self when a solution to a problem, an idea for a song or other creative impulse bubbles up during your meditation. Your mind has a catcher’s mitt, so you start catching the arising bubbles, which makes your meditation be merely about your life, a way to solve problems or make money. This is a trap. Remember the goal — to know your own Self as Consciousness-Itself. Meditation will take you all the way in, but you have to put down your catcher’s mitt and meditate longer. Get past the rising bubbles of creativity to find the source they’re coming from – your own Self which is Consciousness-Itself. You will not only get one answer from there; you’ll find all answers there. You don’t merely have the capacity to be creative for a few moments. You are the Source of creativity itself. When you base your life and being in that inner reality, you live in an endless flow of creativity that never dries up. You won’t have to wait until you meditate. You will live in the experiential knowing (svaroopavidya) of your own Divine Essence. This entry was posted in Mystical Living on March 10, 2019 by Swami Nirmalananda. Once I received initiation from my Guru, the fire of yoga began to blaze within me. 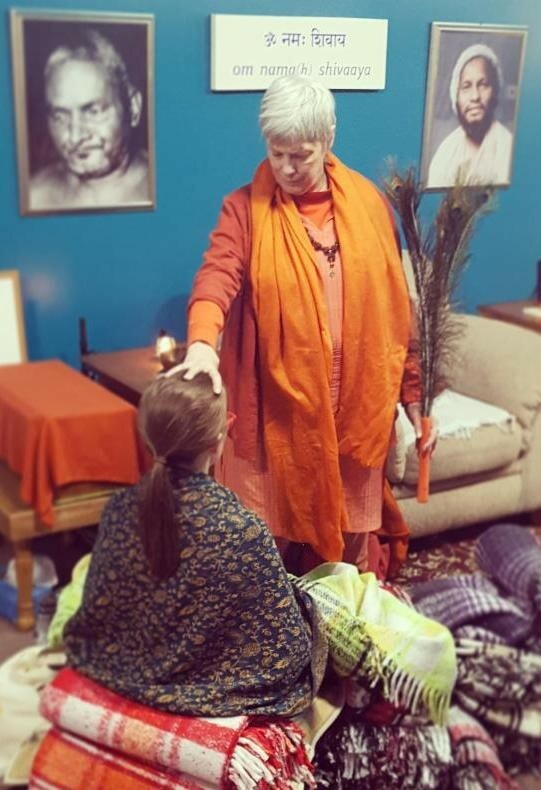 I wanted to surrender to this inner flame, and learned how under my Guru’s watchful care and guidance. 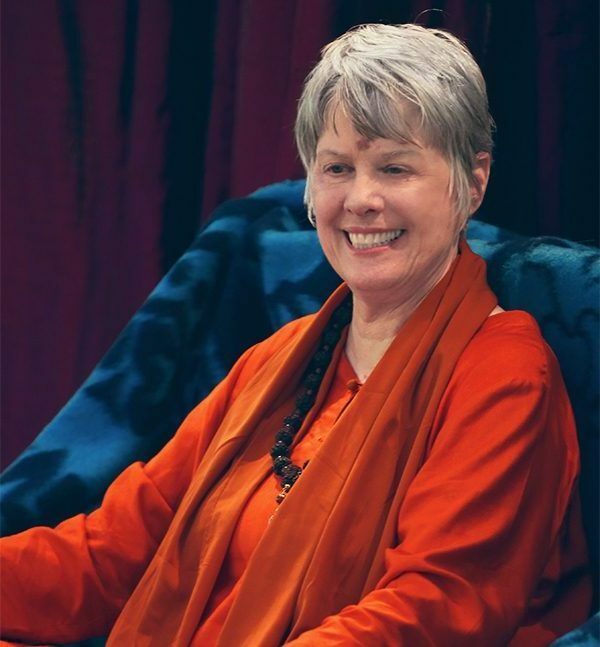 Kundalini taught me about core opening, through the physical movements (kriyas) she prompted in my meditations. My gratitude will never end for what my Baba gave me. He was one who could give the gift of enlightenment! Along with this inner awakening, He taught me to trust what Kundalini brought forth within me. Every time I had a doubt about a new level of inner opening (and I had many doubts), He reaffirmed for me that I could trust the arising of Consciousness within me. By the time he sent me back to America and I began teaching, I knew that I knew. Your practice of the discipline named Svaroopa® yoga, based on the key principles of precision and compassion, allow you to mimic the physical processes I went through in my early years with my Guru. The awakened Kundalini moved me through the full range of yoga poses, but in a way that opened my spine effortlessly — a radical departure from what I was doing and what I saw others doing in our yoga classes, as we tried to move our bodies into our idea of the picture-perfect pose. I knew that “imposing” the “pose” on my body was wrong because I experienced the grace and ease of each pose in my meditations, when Kundalini moved me. 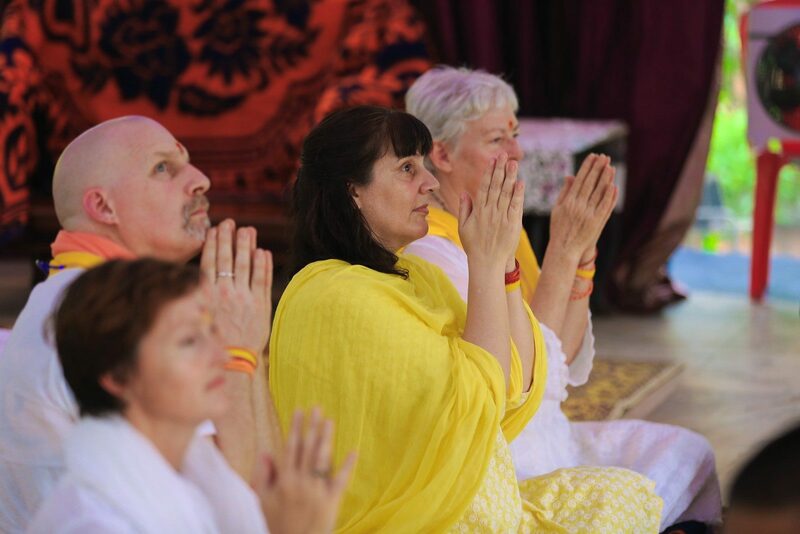 As my process advanced, I left the physical kriyas behind and experienced Kundalini clearing my mind and heart. She unraveled the crazy-bits, of which there were many, by tracking them to their inner-most kernel: again and again I confronted the fear that drove all the crazies. But I couldn’t unravel the fear. My Guru did that. I know what Grace is, for it begins the process (through Shaktipat initiation), supports the process (the ever-present umbrella of Grace) and it completes the process (the inner revealing of who you really are). Even if you don’t know what Grace is, Svaroopa® yoga is the yoga of Grace. Every time you target the core tensions and melt them away, tail to top, you open yourself to Divine Grace again. Core opening is a process of inner opening, surrendering the way you resist your own Divinity and surrendering to the inner Reality of your own Self. The practices invoke the blessing of the ages, coming from the sages and masters of yoga, those who are gone and those still alive. 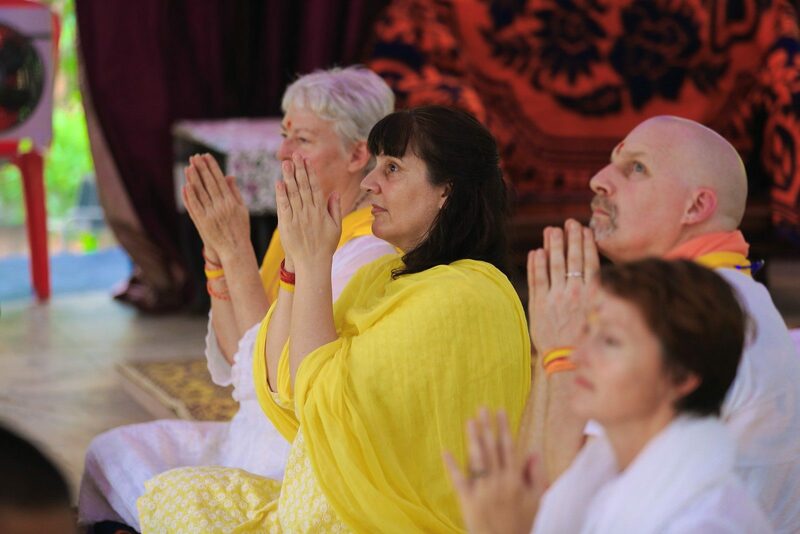 Most students of Svaroopa® yoga experience Kundalini awakening within their first two years of regular study and practice; many experience this incredible gift in their first class or in their first year. Or you can simply come to a Shaktipat Retreat and get it in a weekend. 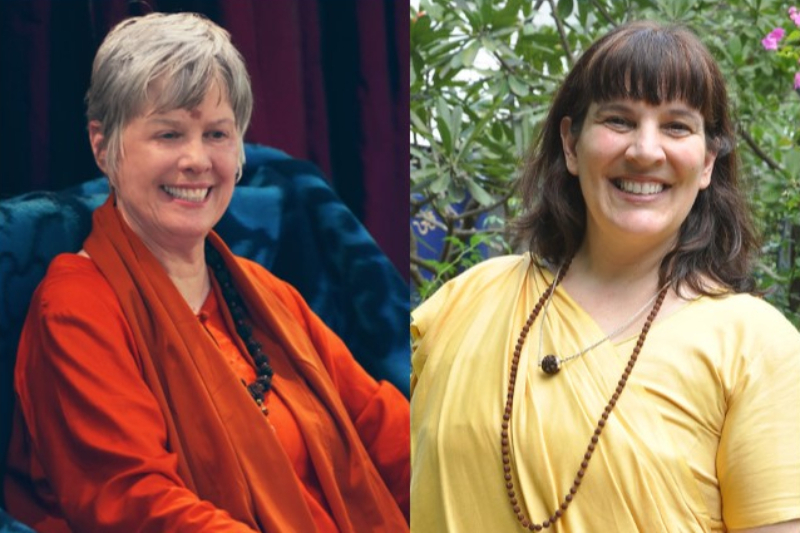 What will Kundalini do for you? How do you know if your Svaroopa® yoga practices have awakened this Divine Power of Revelation within you? If you feel the inner heat climbing your spine or radiating from your core, the revelatory power of Consciousness (Kundalini) is awakened and working within you. If you dive in deeper than deep, losing track of time and place, the doorway to your own Divinity has been opened; Kundalini is opening you from the inside out. If you find yourself lifted or moved effortlessly into a deeper angle in a pose or even right into a painful spot (to burn it away), the fire of yoga (Kundalini) is moving you light-years in a few breaths. When you get inner answers, always right even when they don’t make sense, Kundalini is showing you how to live your life by the inner compass. When you stop craving things that your mind still says it wants, Kundalini is freeing you from your compulsions. When you find that everything you thought you wanted is just a summer rerun, and you realize that what you want is something more… you’re on the path. This is yoga. This is Svaroopa® yoga. The Yoga of Grace. This entry was posted in Mystical Living on March 3, 2019 by Swami Nirmalananda. The millennia-old yogic tradition is based on yogis helping yogis. While Western yoga is focused mainly on entry level practices (poses, breathing practices and chanting), there’s help every step of the way. 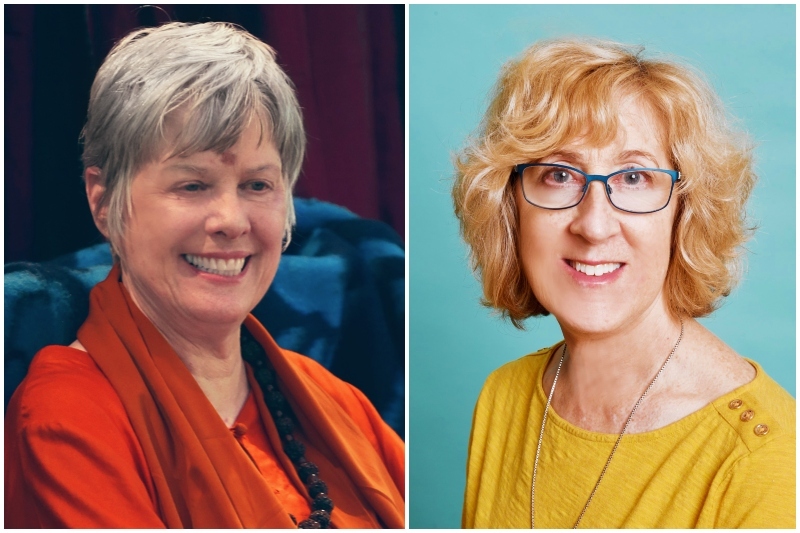 Even if you’re doing it yourself by working through a yoga book, DVD or website, you’re getting a boost from the writer of the books and cards and the makers of the DVD and websites. You don’t have to reinvent the wheel. As your yoga progresses into the subtleties, into the more powerful realms of inner exploration, the help you get also becomes more subtle and more powerful. Yoga calls this k.rpa or anugraha, Divine Grace. Your interiorization moves through stages of contemplation (dharana) and meditation (dhyana), culminating in profound and deep experiences of inner absorption (samadhi). Practitioners of Svaroopa® yoga’s core opening poses already know the early levels of samadhi, found so easily in the seated poses and twists, and especially in your many Shavasanas. To excavate more deeply within, all the way to your inner Divinity, you have to sit up. All your spinal release has prepared you for an easy seated pose, so the meditative energy (Kundalini) can climb your spine. This sutra is saying that there are yogis who are capable of giving enlightenment to others! What kind of amazing gift is that? Personally, this is what got me into yoga and kept me so focused for so long. 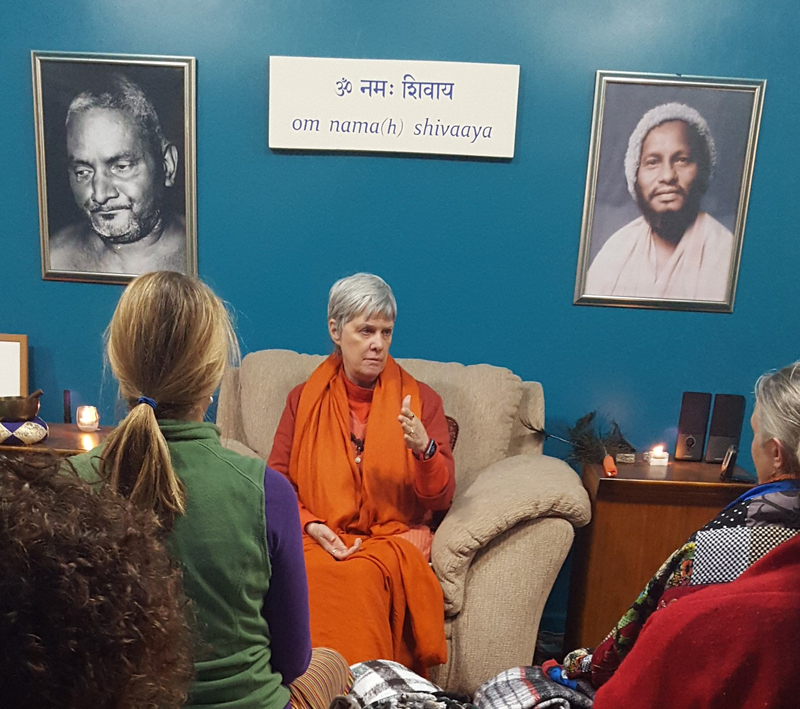 Having met such a yogi, my own Guru, I knew I was being given a gift beyond comparison — Grace. I wanted it. I knew yoga’s promise was true because I tasted it again and again; samadhi is a taste of enlightenment. I dedicated my life to finding all that yoga promises. Yoga leaves no stone unturned. If yoga left stones unturned, the crawly critters in the hidden corners of your mind and emotions would keep you from knowing your own Self. You must unmask your inner demons, but you don’t have to do it alone. You will outgrow your fears and obsessions; this is yoga’s promise. This is due to the power of Grace. Svaroopa® yoga is the yoga of Grace. For me, it is the yoga of Grace because I got it from my Guru. For you, it is the yoga of Grace because it jump-starts your inner evolution, the discovery of your own svaroopa — your own Divine Beingness, your Self. This entry was posted in Mystical Living on February 24, 2019 by Swami Nirmalananda. As soon as the bridge was built, Rama commanded the army to move across the sea to Lankapuri. The troops crossed the sea, reached Lankapuri and made camp at the shore. Ravana sent two spies to gather information about the army. They turned themselves into monkeys and roamed around the camp. Vibhishana identified them as rakshasas and started punishing them. Rama intervened and released them, instructing them to carry the message about the strong and aggressive army to Ravana. When the two spies returned, they described the monkey army and its strength, but it still didn’t change Ravana’s mind. The mandate was sent to Ravana’s commanders to roundup the troops for battle. As Ravana’s troops were getting ready for the war, Ravana played one of his tricks on Sita, to persuade her to marry him as a last try. He brought the severed head of a person resembling Rama, saying Sita’s husband is dead and that the only way left for her now is to marry him. At first Sita fell, trembling, on the ground. When she regained consciousness, she asked Ravana to behead her so she can join her husband. At that moment a messenger arrived, bringing Ravana word from the chief of his army. Ravana left in haste and the head of Rama disappeared, revealing to Sita that it was a yet another trick by Ravana. Ravana left Sita at the news that Rama had reached Suvela Mountain. Rama and others went to the top of Suvela Mountain, from where they could see the city of Lankapuri. Ravana stood there, above a gateway to the city. Seeing him, Sugreeva sprung into action, leaping on top of Ravana. They dueled for a long time. Finally, after reducing Ravana to exhaustion, Sugreeva stole his crown and came back to Rama. Embarrassed by this, Ravana replied, “I will die before making peace with my enemy.” Angada tried his best to convince Ravana to settle it all in a peaceful manner, but Ravana was firm about going battle instead of conceding defeat. Angada then firmly planted his foot on the ground, challenging anyone in Ravana’s court to uproot his foot. If they could, Rama would admit defeat and return home. 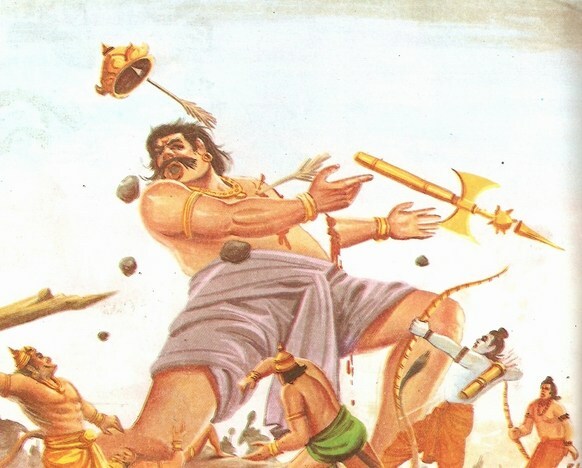 All the mighty Rakshasa commanders, including the mighty Meghanada (Ravana’s son, also called Indrajit) tried their best to uproot Angada’s foot but none succeeded. Angada warned Ravana, that this was his last chance to save himself and his kingdom. Ravana ordered him seized, but Angada jumped to the ceiling and escaped. Angada returned to Rama, giving him Ravana’s refusal to make peace. So, the inevitable war began. Ravana led his army himself on the first day of battle. The battle was fierce, but at the end of the day Ravana’s army was destroyed and Ravana stood in the middle without his chariot or his weapons. Rama said to Ravana, “It is not right to kill someone who has no weapons to defend himself. I give you time, to think. Go back today and come tomorrow if you still feel that you must go to war.” The disgraced Ravana returned home. Even after his defeat, he didn’t give up on his lust and greed. The next day Kumbhakarna was awake, disturbed from his six months of sleep, with diminished powers. He had been informed what had happened and tried his best to bring his brother Ravana to his senses, but was not successful. Even after Ravana’s ill words against him, Kumbhakarna decided to fight for his brother, for family’s sake, unlike his other brother, Vibhishana. Yet Kumbhakarna knew he was not on the side of righteousness. He gathered the troops and marched to war on the second day. Kumbhakarna did his best, but with his diminished ability and strength, was in no way a match for Rama. By the end of the day, Rama killed Kumbhakarna, freeing the gatekeeper Vijaya from his second life on earth, leaving only one more to go before he reaches the gates of Vaikuntha again. Over the next couple of days, Ravana’s younger sons went to battle, encountering the same result as their uncle. Ravana went into unbearable pain due the demise of his brother and sons. Seeing his father’s grief, the powerful Meghanada, Ravana’s eldest son, went into battle. Meghanada had a lot of astras (energetic weapons) from boons he’d received due to his long austerities and worship. He fought valiantly for days. He first bound everyone on the enemy’s side with his Naga-astra (cobra astra), making all of them faint. Garuda (Lord Vishnu’s eagle mount) came in to break the bindings. Meghanada then wounded Lakshmana with one of his arrows. Hanuman flew off and brought the physician Sushena to cure him. Then Meghanada used his Brahma-astra (Brahma’s astra) to disable everyone except Hanuman, who flew to the Himalayas to bring back the hill with the “Sanjeevani” herb to cure everyone. Having failed to defeat Rama’s monkey army with his astras, Meghanada went into a secret place to perform a yaj~na to get more powers. Finding out about this, Vibhishana helped Rama to find Meghanada. Lakshmana battled with him, killing Meghanada after a fierce fight. Ravana lost his senses when he heard that his eldest son had perished. Yet, even after all this, Ravana didn’t want to concede defeat. He gathered all the Asuras who were alive and led them into battle. At first he was fighting with ferocity, annihilating the monkey army by firing arrows with his twenty hands. Using magic, he replicated himself, confusing the monkey army. Ravana seemed to be unconquerable; though Rama cut off one of his heads several times, another took its place as soon as one head rolled off. With the battle seeming like it would go on forever, Vibhishana revealed the secret that Ravana’s nectar of life was stored in his navel. At the end of the war’s eighteenth day, Rama killed Ravana by firing arrows at his navel, his heads and his hands at the same time. Thus, Jaya finished his second birth on earth, joining his brother Vijaya. Vibhishana went into unbearable grief due to his brother’s death, and performed all the last rights for his brother. Ravana’s wife Mandodari sacrificed herself on the funeral pyre. Rama crowned Vibhishana as the King of Lankapuri. 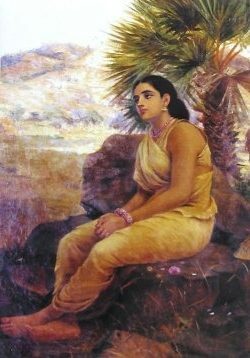 Then Vibhishana released Sita from the palace’s forest garden, Asoka Vatika. According to Rama’s request, Sita took the test of fire to prove her chastity to the world. Then Rama performed a penance at Setu Beach, a ceremony to Lord Shiva, for being the cause of countless lives lost in the war. Rama returned to Ayodhya one day early, before the 14 years was complete. He refused to enter until his vow was complete, so he and all his party camped outside the city walls. The sage Narada came for the great events along with many others who were awaiting the auspicious morning. In the wee hours, well before the sunrise, Narada began to wonder, “Who does Rama worship? Maybe I can go spy on him!” Creeping quietly through the dark campground, Narada positioned himself outside Rama’s tent. He saw the flickering light of a flame and heard soft chanting and a bell, so he peeked through a slit in the canvas. Ah! 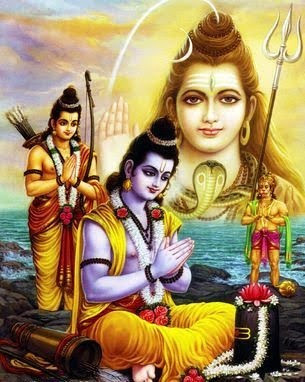 Rama was worshipping Shiva! Narada thought, “This proves it; Shiva must be the highest God! But then Narada thought again, for Shiva was there in the camp as well, incarnated as Hanuman. Creeping through the dark, Narada approached Hanuman’s tent. Again he saw flickering light and heard soft chanting. Peeking through the flap, Narada saw Hanuman worshipping Vishnu, who had incarnated as Rama! Thus Narada, the great devotee, was confused. Who is the highest God? Vishnu has incarnated as Rama, and is worshipping Shiva, but Shiva has incarnated as Hanuman and is worshipping Rama. The answer is found in the greatest mystery of all — there is only One. That One is found within. This entry was posted in Mystical Living on February 17, 2019 by Swami Nirmalananda.